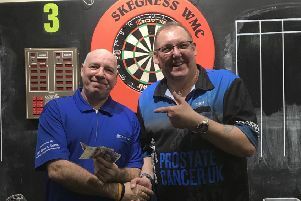 Mark Forman claimed the final spot in next month’s darts Pro-Am following his victory at the final qualifier - putting together a 12-game winning run in the process. The Last Man Standing competition saw entries draw balls to see where they would join the winner-stays-on format, with Forman earning the right to be the final player to team up with a professional in next month’s event. A strong field of 25 saw some quality players turning up, and with supporters outnumbering the players it just shows how popular these events are. Drawing ball number one meant it could be a long night for Liam Simms, or Jamie Cooper, who drew number two. Liam edged the first contest and also progressed against Jass Smith. But Liam and his fans were silenced as Chris Fletcher defeated him before being knocked out by Dave Kemp, who embarked upon a three-win running spree before finding Andy Markham too strong. David Tuplin was the next man to string a few wins together, winning four games, including a 74 finish and a 20-dart leg, before Lee Woods ended his great run. Then came Forman, who offered a masterclass in darts, coming in at number 14 and needing to win 12 on the trot if he was to succeed. He did just that , with only one of his wins going over 20 darts as he posted 16, 2x18, 4x19 and 4x20 dart legs. The draw for November 6’s Pro-Am pairs has taken place, and the teams will be Devon Petersen and Lee Dore Snr, Colin Osborne and Steven Emsen, Robbie Green and Martin Bell, James Wilson and Mark Forman, Kyle Anderson and Christopher Royal, Wes Newton and Scott Smith, Andy Hamilton and Darrell Webb, Dean Winstanley and Brad Martin. The event starts at 2pm at the Ex Service Masters, where these eight pros will battle it out. Then at 7.30pm the eight pairs will toe the oche, and entry is free. On Friday, October 28 the Team Lowe versus Team Bristow qualifier will be held at the Liberal Club. These two legends are captaining teams of nine, with the winners going through to the final on February 24 at the Liberal Club. On Sunday, October 30 the Mick Peech Memorial event will be held at the Liberal Club.